MAPP GAS MG9S,16 OZ/453.6 GM is rated 5.0 out of 5 by 3. 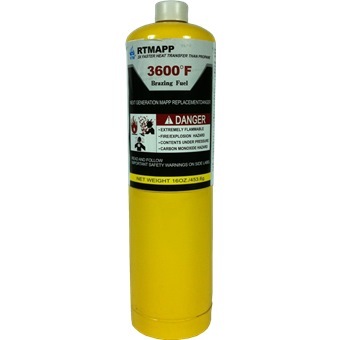 MAPP gas can be used in combination with oxygen for heating, soldering, brazing and even welding due to its high flame temperature of 2925 °C (5300 °F) in oxygen. 1) Check cylinder and torch seals. 2) Never use with damaged or missing seals. 4) Hold cylinder upright while attaching torch. 7) Read and follow torch instructions. 1) Use upright to prevent flare-ups or flashes. 2) If torch sputters ,turn cylinder upright and turn off. 3) Never use near pilot lights , flames, sparks etc. 1) Turn off torch and let it cool. 2) Detach torch when not in use. 3) Detach outdoors away from pilot lights,flames and sparks. 4) Replace cap to keep valve clean. Rated 5 out of 5 by Junyuan from Great to use for searing food I bought this to use together with my Searzall to sear steaks. Works great. Rated 5 out of 5 by johntan from Good product; Great price Item arrived sooner than expected. The gas burns hotter than regular propane. Priced very competitively too! Rated 5 out of 5 by Christopher from Value for Money I received item in very good condition and on time, with delivery as expected. The product was of good value and it was worth spending the money on. Great service from staff on queries.